We've shown you how to turn a regular SIM into a Micro SIM, but what if you want to do things the other way around? 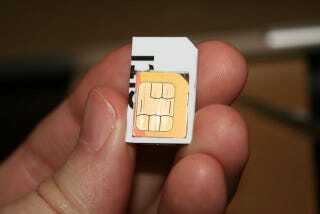 Here's how to turn a Micro SIM into a regular-sized SIM card. You'll simply take a regular SIM card and trace it onto an old gift card, credit card, or other piece of hard plastic. After you cut out the shape, you'll need to figure out where your Micro SIM would have to sit inside that in order for its contacts to be in the same spot on those of the regular SIM. Then you'll cut and trace a hole, slip in your Micro SIM, slap some tape onto the back so that it doesn't fall out, and tada! You've made yourself a Micro-SIM-to-SIM adapter.